Cold calling is at the top of salespeople’s hate list, that’s for sure, but it seems that “follow-up” upholds second place. However, statistics show that 80% of sales require 5 follow-up phone calls after the initial contact, and yet a whopping 44% of salespeople give up after just one follow-up. That’s a great number of wasted opportunities, and the whole problem can be boiled down to the fear of being rejected or annoying after you follow up. This shouldn’t be easily dismissed because there’s a thin line between being persistent and being a nuisance. Still, there are some rules that can help you follow up with your prospect, without causing plenty of eye-rolling. Another problem lies in the fact that most marketers spend significantly more time crafting their ice-breaking, cold email. Of course, leaving a memorable first impression is a must, but that doesn’t mean that the second or third email should be a bland, half-baked reminder that you have already contacted them. Studies say that most people answer to the second or third email from a sequence, and it’s self-explanatory why you should put all your efforts into making them worth reading. Follow-up Rule #1: Calling or Emailing? Both. The jury is still out on this one, as it’s mainly a matter of preference. Some prospects don’t like to be disturbed by phone calls while they’re still weighing up their options and considering your offer. That’s why the best option is to ask them candidly how they would like to be contacted in the future. Many people choose email as their preferred medium of communication. That’s ok but bear in mind that you’re dealing with businesspeople who receive as much as 200 emails a day, or even more. This means that your message might end up buried in an avalanche of unopened emails. You can bring this issue up, and suggest some kind of solution, such as sending them priority emails or adding something specific to the subject line that will make your message stand out. Finally, you should also establish a response time frame, as laying down some technical ground rules will help you do your job and avoid that “annoying salesperson” cliché. First of all, you have to know your audience well to know which channels they prefer. Although you should stick to their favorite mode of communication, it’s a good idea to use various methods. Email marketing is perceived as less intrusive than cold calling, but, both these strategies have their own benefits. Phone calls are more personal, and they can help you increase awareness and familiarity. So, one of your follow-up steps should be making an appointment with your prospects so that you can explain your offer in more detail. Autoklose has an integrated calendar option, which means that your prospects can access your calendar, see when you’re available, and book a call or meeting with you directly from the email. When it comes to follow-up emails, there’s one more thing to be discussed. As you’re dealing with businesspeople who send and receive as much as 125 emails a day or even more, your message might end up in an avalanche of unopened emails. Finally, you should also establish the response time frame, as laying some technical ground rules will help you do your job and avoid that “annoying salesperson” cliché. Whatever you do, don’t succumb to the temptation to include that artificial, deceitful [Re.] in your subject line in order to get your emails opened. This will work just once, and you can count that your prospect will mark you as a spammer. Besides these traditional marketing channels, social media is also an excellent way of getting in touch with your prospects and establishing meaningful outreach. If you respond to and re-tweet their tweets, tag them in your posts, comment, and answer their questions, you will strengthen your relationship with them. This way you’ll boost your engagement and warm your prospects up which will result in your improved open, click-through, and response rates. The fact that your prospect wants to be contacted via email doesn’t mean that you shouldn’t suggest connecting on LinkedIn, Twitter, or even Facebook, especially if you post articles or share some valuable resources there that they can benefit from. After opening this channel of communication, you can also show interest in your prospect’s online activity by liking, sharing, or commenting on their posts. However, make sure not to cross the line by being too intrusive or coming off as a stalker. A phone call or a meeting with a prospective client that went well should never end with “talk to you soon” or “we’ll get back to you”. This means that you’ll have to wait for them to ping you, and that’s a very unpleasant and vague situation. In order to avoid this, try to schedule your next meeting by asking your prospect when they’re free and sending them an invite right away. If they’re asking for a proposal, insist on making an appointment during which you’ll review it together. This is a clever move as the perfect moment to define the next step is during a successful discussion. All it takes is a little push in the right direction. There’s no need to hesitate and delay, so strike while the iron is hot. Many salespeople make the mistake of calling or contacting their prospects simply to check in and stay on their radar. This is a bad idea because the only reason to reach out should be when you’ve got something to say or offer. Calling or emailing only to remind them of yourself or your company is annoying, off-putting, and can only deter your prospect even if they were initially interested in doing business with you. Instead of that, what you should do is read what your prospect and their company say on LinkedIn or Twitter, and see if there’s something that you can offer your advice on or help with. That would be a legitimate reason to call and still not reek of desperation. Whenever you can’t clearly state why you’re calling, without beating around the bush and being vague, don’t call. However, it’s worth noting that in certain cases, for example when you’re waiting for your prospect to make up their mind about your offer, it’s actually good to give them a nudge. No matter what kind of response you get from your prospect, always thank them for their time. These days everybody’s schedule is jam-packed, so the person who took the time to read your proposal or talked to you on the phone, even if they couldn’t accept your offer, deserves appreciation. Besides, they might additionally help you by giving you some valuable insight on how to improve your proposal, or offering you a new contact who could be interested in your products or services. So, sulking and acting as if they owed you something isn’t appropriate. Mentioning how many times you followed up, or how much effort you put into making a proposal is a major no-no, so be polite and respectful regardless of the outcome. Personalization is all the rage at the moment. No wonder, when nobody wants to receive those boring generic emails which have clearly been composed for a mass audience. People want to read emails that are relevant to their needs and interests, which means that a one-size-fits-all approach won’t work anymore. Moreover, a survey has shown that 57% of consumers are ready to share their personal information with brands in exchange for relevant information and personalized offers and discounts. Segmentation is the first step when it comes to creating a personalized campaign. After that, it’s crucial to use a reliable sales or marketing email automation tool, such as Autoklose, which will use your contact database to automatically personalize your emails. However, true and effective personalization goes well beyond first names and job titles. Our recently introduced feature, Custom Fields, enables practically unlimited personalization possibilities. The trick lies in the fact that you can create your own custom fields and incorporate them in your email campaigns. While automation can help you personalize your sales email campaigns at scale, sometimes you’ll need to do your research in order to achieve that 1-on-1 personalization required when a large and important deal is at stake. Browse your prospect’s social media channels, their company website, and try to find out as much as possible, because that way you’ll make your outreach relatable. Information such as a big merger, new releases, or any other announced changes in their company is a perfect background and an effective icebreaker for your outreach. Turn such an event into an opportunity by aligning it with your offer and the benefits your products or services can provide. The fact that you’ll make a great impression on your prospects by showing them how detail-oriented and thorough you are is an added bonus. Data decay is a serious problem which can cost you a lot. For example, back in 2016, the cost of bad data in the U.S. reached a stunning $3.1 trillion according to IBM. Email marketing databases naturally degrade at a rate of 2.1% a month, which adds up to 22.5% annually. People change jobs, phone numbers and addresses, while companies disappear and change their business model or direction. If your database isn’t updated, you can waste your efforts and resources on barking up the wrong tree. This is particularly dangerous when it comes to cold outreach, as you might end up sending emails and follow-ups to an incorrect, obsolete, or defunct email address. Apart from being futile, this practice puts you and your business domain in danger of being blacklisted by your ISP. Namely, defunct email addresses are frequently used as spam traps, and if you keep on sending emails to such addresses, you risk being proclaimed a spammer which can hit your online reputation and marketing efforts hard. Autoklose comes with a huge database packed with millions of clean, relevant, verified, and regularly updated B2B leads. But these leads aren’t just randomly crammed into one place – the database is searchable, and you can use different filters to refine your search and get the best results. To read more about the importance of maintaining a clean database, check out our previously published post on the topic. There’s no better way to follow up with your prospects than by including social proof in your follow-ups. Your prospects are busy professionals and don’t have much time to try and find out what others say about your company on the internet. But, you can bring them all those raving reviews and positive feedback so that it’s the first thing that captures their attention when they click on your email. Modesty isn’t the best policy when it comes to marketing, and it’s even better when somebody else praises you. Credible certifications which prove that you’re a successful and respected company based on certain estimates – include Capterra or G2 Crowd badges, for example, if you have them. When and how often you should follow up with your prospects is of crucial importance. If you exaggerate, you will be perceived as a pest who bombards them with emails, but if you aren’t persistent, you won’t be on their radar. 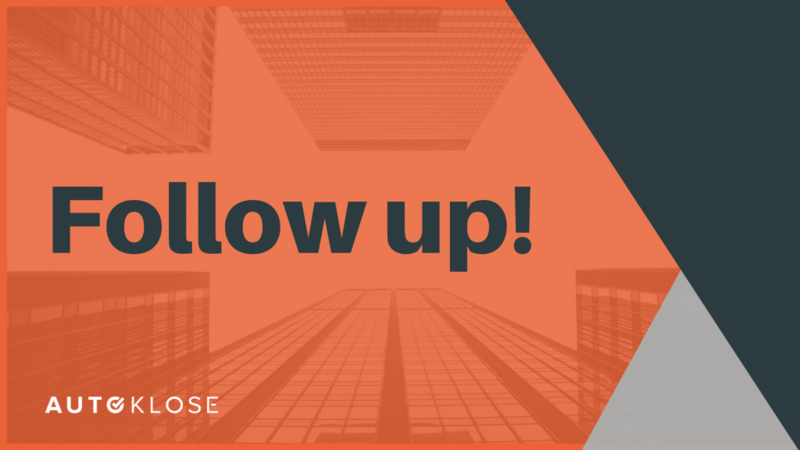 So, how to send a follow-up email without being too pushy? A good rule of thumb is that your first follow-up should be sent within the first 24-48 hours after the initial email, phone call, or any other contact. If you get back too soon, you will give the impression that you’re too impatient or desperate, and nobody likes that. After the first follow-up, you should reduce the frequency and contact your prospects within the next 2-4 days. The next step should be taken after 5-7 days, and after that, you should make a pause of approximately a month before sending the next follow-up. Basically, you don’t have to worry that you’re being a pain in the neck as long as your prospects don’t unsubscribe, but you surely have to be careful not to outstay their welcome. However, if a certain prospect has been unresponsive for quite some time, you should eventually stop following-up. But, before you do that, give that contact one more shot – send them a break-up email in which you’ll announce your departure from that unilateral relationship and emphasize that you’re very sorry to do so. Also, make sure to mention the value that your prospect will lose if you stop pursuing them. provide all your contact details. In case you need some examples, we’ve discussed this and other types of emails in our recent blog post, and there you can find ready-to-use templates as well. Success is all about persistence and doing the right thing for the long term. This quote by Bruce Rauner, an American businessman, and politician, perfectly sums up what your approach to following-up should be. These subtle follow-up techniques will put you in your prospects’ good books, and land you a lot of sales opportunities. 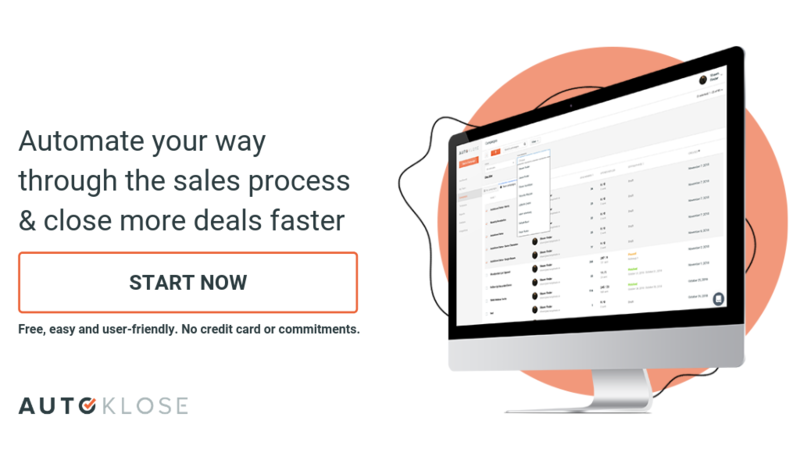 Autoklose — Automate your follow ups the right way.